Can you tell me what story these sounds come from? I would lay bets that most of you could tell me where those sounds come from; a bunch of you, certainly in my family, already have the famous tune playing their heads. It’s been 35 years since the movie came out – I was only eight years old – but I remember the cultural phenomenon that Star Wars became, from the moment those words appeared on the screen, and a starship soared over our heads. It seems, perhaps, a sign of the frivolous nature of our society that a science fiction movie can have become so ever present, ingrained even into our language. But Star Wars, aside from being a marvel in special effects, arrived on the big screen in the wake of a terrible war, and a political scandal, and at the end of a decade where too many seemed to have lost direction. In that void the story of a hero and his disciples, and of an all-powerful, life-giving force equally inspired kids and their parents. Certainly, it continues to fire up the imagination of most of the 7-year-olds I know today – who can describe all the characters, even if they haven’t seen the movies. This is the power of myth; it gives us a story around which to shape our belief system. Star Wars swirls into our myths because it contains the archetypes of our cultural beliefs – and in not-very-subtle ways – our religious faith. We have the boy hero, Luke Skywalker who must take on great responsibility, and lead a motley band of followers to shape a new world. We have the disciple, Han Solo, who comes to believe. We have sacrifice, and faith. Guiding it all, we have an unseen powerful force, in which the characters must choose freely to believe. Sometimes, Christians might get a little frustrated – the images of the Bible, that first story of Jesus – are so often lifted into popular culture, that it might seem the message is being twisted and diluted. But in fact, the responsibility is ours – to make the link back, to use the myth as a way to build onto our understanding, to develop our relationship to the original truth upon which every story since has been built. This is the lesson of Pentecost – the freeing message of this Sunday. In our first lesson, the disciples are all together , when suddenly a violent wind fills the entire house, and tongues of fire appear above each of their heads. “All of them were filled with the Holy Sprit, and began to speak in other languages, as the Spirit gave them ability.” And the crowd that gathered became bewildered because they could understand the disciples as they spoke of the deeds of God in their own languages. This lesson of Pentecost went unheard for many centuries in the Christian church, when the Bible was only printed and spoken in a language that most of the common people could not understand. But Martin Luther, of course, understand that God has always meant for the message to be heard in a way that people could hear it for themselves, to take it into their own hearts: and so the Bible was translated into German – and since then into just about every language on earth. Pentecost teaches us that the message of God can be heard in many different ways, and from endless angles of life. One could even make the connection with a TV show like Gossip Girl. We often make the mistake of confining that message of God to speech – but of course, the power of faith and belief reaches out from our art, and our music, our literatures and our movies. The more times we find God in the images around us, the better, stronger and more complete becomes our relationship to God. Our most powerful myths inform our most primary truth. 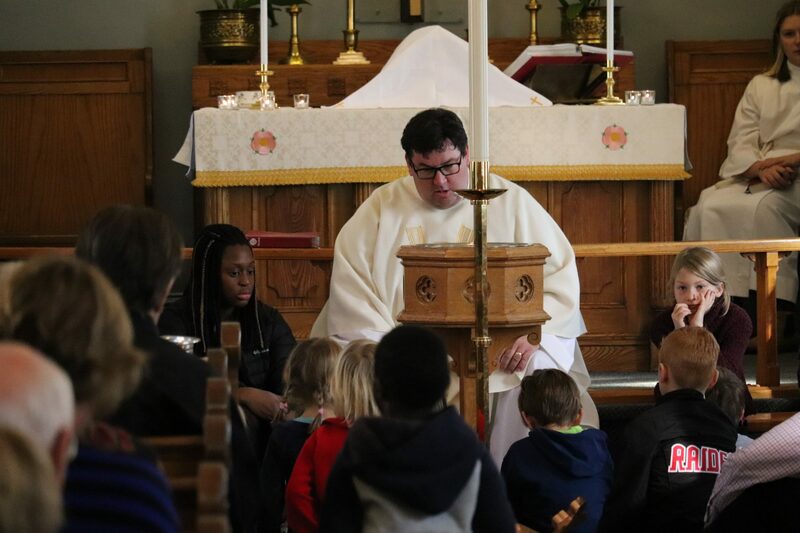 This is the our role as Christians – and our life’s assignment, to remember to look for God – and to be freed up enough to see God – beyond one hour a week when we come to church and God stands so clearly before us – in what we say, and sing, and in holy communion. It is what we need to do especially, when our faith begins to wander, and life throws us in so many directions that we forget where we are going and why. This is my message to the four of you, Kelsey, Chris, Elsa and Alexander– as we all need to remember. Look for God; and feel confident enough to see God in those untraditional spaces, where sometimes God may seem to speak to us most clearly, and with the most passion. If you do this I guarantee your life will be better. It may not always be easy but in those more challenging moments there will be a guiding force beyond your comprehension that loves you without reservation. Trust it. May that force be with you both. Amen.